This chopped salad is my new favorite! It is so tasty and bursting with unique flavors! This salad does take a little but of prep work, but I promise the outcome is worth it! I was especially happy with the salad dressing; it showcases just how delicious and nutritious an oil-free vinaigrette can be! If you are in a crunch for time, just make the salad dressing and simply use it with mixed greens! The shallot paired with the thyme are spectacular! I love fresh thyme! I think this will be one of your new favorite salads too. 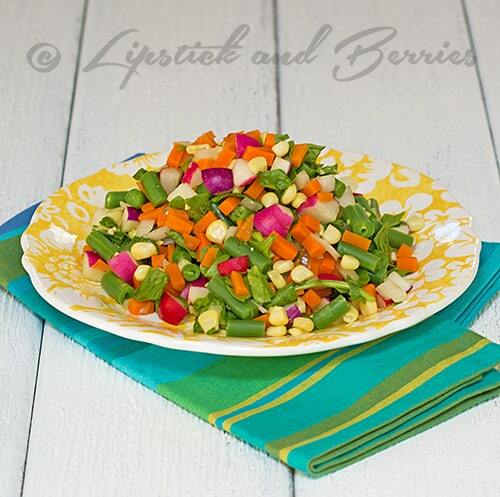 Combine blanched vegetables with other raw vegetables and toss in a bowl. Cover and store in refrigerator until serving time! Combine all salad dressing ingredients together in your Vitamix or high powered blender. Before serving salad, toss with the dressing! Tips To Getting Bikini Ready!